When a rumour of a teacher-student affair surfaces in Texan high school, this ordinary school becomes much more peculiar when everyone tries to find out who it could possibly be. 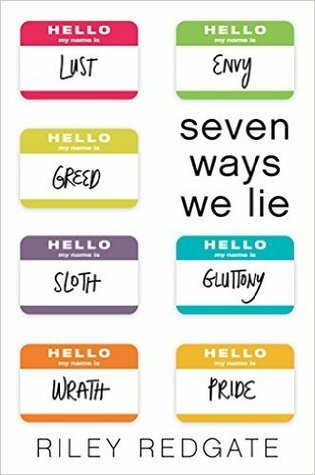 Seven Ways We Lie is a really fun and interesting take on a high school contemporary novel. I liked the use of each character representing a different deadly sin. I didn’t really know what to expect from this but, in the end, I really did enjoy this. The first half was sort of confusing due to the different POVs and it did take me a while to learn who was saying what without having to go back to the chapter title. But Redgate did a good job developing the characters and carrying a story with seven different perspectives however I felt like she lost some along the way. For this review, I’m going to go through each character and their storyline, since I enjoyed some more than others. Claire – Oh my, it was so hard to like her but I did understand her. Claire endlessly compares herself to other, always jealous and anxious. And her self-esteem was constantly lowered by the people around her. But her actions within the novel really pissed me off, and although I understand where she’s coming from, what she did makes me wary of her. Lucas – I was really interested by Lucas. I think this is the first time I’ve read a book with a pansexual character. But I felt like his character was wasted in this novel. And looking back on the book, it focuses more on the others rather than him and I wanted more of him. Valentine – Similar to Lucas, I felt like he had no proper basis, aside from him being the one who realised the teacher-student relationship, but I quite like them together. Matt – Matt is that weird kid that smokes pot and has a ridiculously huge crush on Olivia. The scenes with his younger brother were really cute, but I didn’t like how stalkerish his crush with Olivia started out with, but the storyline with his family was interesting to read. Olivia & Kat – I’m putting these two together since they’re twins. After their mother walks out of them, Olivia and Kat separate themselves from the close family they once were. Olivia becomes subjected to rude comments because of her sexual choices. (there’s a scene where she received a unsolicited picture from a boy, and honestly, her reaction was so funny and I liked how she called the boy out on it) She’s a top favourite, and the way she cared for her sister, despite her distancing, I found admirable. Kat spends her time with practising for the school play or ditching school to play games all day. She doesn’t know how to let go of her anger, and that I can relate to. Although, I have to say the description makes it seems like the teacher-student relationship is the main focus of the plot but really it’s one of the many sub-plots. Towards the end I felt like we’re steered into rooting for the teacher, but the relationship felt so unhealthy. Though from the way the story unfolds, it’s pretty clear there’s no abuse of a teacher position towards a student, but they were still the responsible adult and, in my opinion, they should’ve known better. Overall, it’s an entertaining debut, with witty dialogue and complex characters. Riley Redgate is an author to watch. Hi! My name’s Zaheerah and welcome to my site! You’ll most likely see reviews and book chatter here! → Want to talk? To submit a book for review, please read my review policy and submit your request there as well. Want to chat about anything else? Email me! Instagram and Goodreads for bookish news and updates!